As the reader of this article, I guess you already have some knowledge of Japanese culture. You might not speak Japanese, you might not have been to Japan, but you must have heard of the professional entertainer, the Geisha. Some people misunderstand the role of the Geisha and think that Geisha are prostitutes, but this is totally wrong. Maiko and Geisha are famed for entertaining customers since the 16th century in Kyoto, Japan – which used to be the capital city. It is amazing that many of them still carry on the tradition in the same way, though this is rare for many of Japan’s cultural assets, as Japanese people love to follow the new cultures. Geisha, or Maiko, have sometimes, through the years, been involved in some political issues, such as the Shinsengumi police and the famous samurai Ryoma Sakamoto in the late 19th century. Maiko and Geisha have played an important role in Japanese history, and even now, many Japanese politicians make use of a room at an Ochaya to discuss politics and business. This is because the Ochaya, its Maiko and Geisha, have all been highly trained to be discreet and tight-lipped whilst with their customers. So it is all very fascinating, and there is so much more to know, but I would like to make sure that you fully understand the Maiko and the Geisha correctly. I would like to take this opportunity to explain the differences between Maiko and Geisha, Geisha and Geiko, Maiko and Hangyoku, Geisha and Oiran. Are you confused already? Don’t worry, because it is difficult for even Japanese people to explain the what the differences are correct. Let me start by explaining these ones by one, so that everything will be clear for you, in the hope that it might be of help to you, in case you, by chance, spot a few of them when out and about in Kyoto! What is the difference between Geisha and Maiko? It is very simple, Maiko becomes Geisha. So Maiko are younger than Geisha and are an apprentice to a Geisha. Easy isn’t it? Let’s look a bit deeper for more differences, and see how much you really know! Geisha: Use a wig, not their own hair. Maiko: Use their own hair to make the typical hairstyle. Geisha: Very simple and smaller than the Maiko’s one. Maiko: Very decorative and large. Geisha: Usually one color with patterns only near the bottom. Maiko: Very colorful and quite flashy, with patterns from shoulder to the hem. Geisha: Collar for Geisha is just white and plain. Maiko: Maiko’s collar is also colorful with patterns. Geisha: Narrower than the Maiko’s, with one bow tied as a box at the back, and not hanging. Maiko: Very colorful with patterns, hanging down at the back, almost reaching the calf. Geisha: Lower than the Maiko’s ones – Geta. Maiko: Quite high, unpainted wooden clogs – Okobo. A Maiko is an entertainer who performs and pleases customers by “Kabuongyoku” (dancing and playing musical instruments) and they exist in an area called “Gokagai” – consisting of five hanamachi, or districts, in Kyoto – Pontocho, Kamishichiken, Miyagawacho, Gionkobu, and Gionhigashi. Maiko are young girls aged around 15 years – and following their graduation from junior high school, and up to 20 years old – and are apprentices to a Geisha, called “Shikomi”, meaning ‘half way to fully-fledged’. Maiko in Kyoto and Hangyoku in Kanto area are exactly the same. Maiko training is very important and includes; dancing, singing, shamisen (a musical instrument), tea ceremony, flower arranging, customer hospitality, etiquette, and tradition, all of which are thoroughly taught by their Okiya – a boarding house. This classical education system by the Okiya, only remains in the Gokagai. So if you use the word ‘Maiko’, then you are referring to Kyoto only. When a Maiko has completed her training, and the Oka-San (an owner or mother at the Okiya) and an union agree that the Maiko is fully skilled in all aspects of her training, then before her 20th year, the Maiko can finally become a Geiko by doing something called Erikae (襟替え), ‘turning of the collar’. In fact, some don’t ever become independent, and instead, some leave Kyoto’s “Flower and Willow world” (花柳界/Karyukai). So becoming a Geiko is much harder than becoming a Maiko, from an apprentice to a professional entertainer. Now I hope you understand that a Maiko is the apprentice of a Geisha, actually Geisha is called “Geiko” in Kyoto. So a Maiko becomes a Geiko only in Kyoto. Maiko and Geisha disappear around a corner into Ochaya very quietly. People who see them on the street would never know what would be actually happening inside the Ochaya, because this type of party is kept a secret from the general public. You can imagine that the party atmosphere changes instantly once the guests welcome a Maiko and a Geisha. 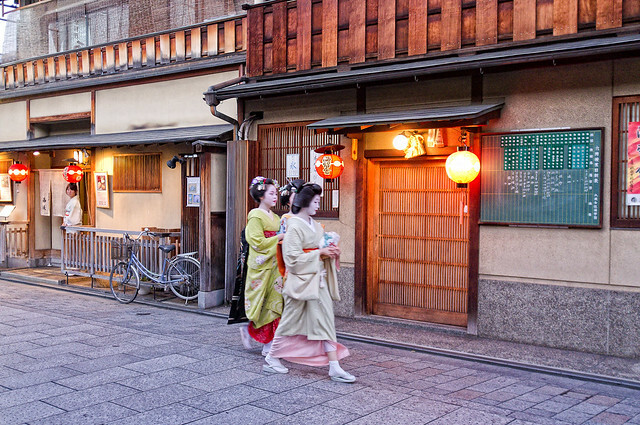 I certainly imagine you would love to spot a Maiko and a Geiko in the street when you travel to Kyoto! Although “Geisha” (芸者) are very well-known, and as a word, it is a familiar one in many countries and languages, not many people fully understand the “Geisha” and ”Geiko” difference. I mentioned it above, but let me take this opportunity to explain properly. As a matter of fact, Geisha (芸者) and Geiko (芸妓) are the exactly the same thing – professional entertainers – dancing, singing, playing Shamisen (musical instrument) and treating guests as a professional hostess. Then what is the difference? It is based on where they are located. There are two ways to read “芸妓” as “げいぎ” (geigi) and ”げいこ” (geiko). Please don’t be confused, the word “芸妓” and “芸子” is read as “げいこ” (geiko) in Kyoto, but elsewhere in Japan it is read as “Geisha”. Geisha are treated as celebrities in Japan. If you just spot Emma Watson on Regent Street in London, and she is walking in front of you, people would definitely walk closer to her and want to look at, or try to get her autograph or “selfie” using your smartphone and also a signature if it is at all possible. It is the same when Geisha pass by in Kyoko (but not getting her signature though, due to etiquette) Wow! to everyone to meet Geisha. So, do you understand that you shouldn’t miss an opportunity to meet a Geiko when you are in Kyoto! Same as “Geisha” and ”Geiko”, Maiko and Hangyoku are the same things – both are young apprentices to Geisha (Geiko). But there are some differences between Maiko and Hangyoku, let’s have a look. It is interesting to note that both Geiko and Maiko have “ko” at the end, hence, both are only in Kyoto. Maiko: Aged around 15 to 20 years old. Hangyoku: 18 years of age or above. They both train very seriously in traditional dance, singing, playing traditional Japanese musical instruments and learning customer service and etiquette as an apprentice. How about Geisha versus Oiran? The differences between them are very obvious in their professions and appearance. As you know, the Geisha are professional entertainers and hostesses since the 16th century; but Oiran only existed in the Yoshiwara of Edo (now Tokyo) as prostitutes or Yujo. Compared to the Geisha who dress in simple colored kimonos and other items, Oiran on the other hand, wore more vivid colours, had large kanzashi hair ornaments, and that is why foreign people sometimes misunderstood Oiran and Maiko, because they both appear to wear loud and flashy costumes. It is true that Oiran were a high class Yujo, but the word Oiran was used only after the 18th century. You are now an expert of Geisha culture, which is so unique, and his own history, and nowhere else has this type of culture. How about the next stage for you, having gained more knowledge? Would you now start to search the variety of pictures on Pinterest, or videos on Youtube? That is a good idea, as here you will see the real differences, and you’ll realize that is the best way you to continue your interest in the Geisha culture, and perhaps prepare for a trip to Kyoto one day. But this might not be your goal, maybe there is one more thing that you want the opportunity to experience? Maybe it is to meet a real Geisha in Kyoto? How about being able to chat, use your new found knowledge of the differences between Maiko and Geisha, with a real Geisha in Kyoto? It is usually very difficult for foreign people to meet a Geisha at an Ochaya, where Geisha entertain, because of the tradition of Ichigensan Okotowari – a new customer must be introduced by a current customer of Ochaya. Despite this tradition, there is a way to gain the company of a Geisha, by joining a show offered by Enchanted Time with “Maiko” to make your dream come true. Can you imagine that a Geisha would be able to chat with you with her big smile! I can also suggest another wonderful experience for you. It is a Maiko makeover, enabling you to transform into a Maiko. Maiko henshin (transformation) studios in Kyoto, have become very popular, due to both Japanese and foreign tourists transformation demands, so you might find a very good deal! All Geisha and Maiko are so proud of themselves and their unique culture. Despite the very hard training, Maiko and Geisha are thankful for acquiring the skills of dance, sing, musical instruments and how they should be hospitable to their guests. It is not only these skills, but also their appearance that is exceptional. It is also very interesting to get to know what the differences are between Maiko and Geisha, but also Geisha and Geiko, Maiko and Hangyoku and Geisha and Oiran as all represent Japans beautiful history. Especially with regards to Kyoto and Tokyo, as both have an entertainment tradition, and continue to still have that stays true to this tradition. If you would love to discover the culture, I strongly recommend that you take a trip to Kyoto, because there is a long history of both Geisha and Kyoto that you don’t see in anywhere else in the world– a unique experience here in beautiful Kyoto alone. When I ask my foreign friends a question “Where would you be interested to visit in Japan?” almost all of them say “Kyoto!”. The reason why, they want to feel the real Japan by visiting temples, shrines, trying Japanese foods and drinks, and want to discover more about the Geisha – they are intrigued by them. You can read an article or Google search about Geisha, but you can not meet or chat with one unless you are in Kyoto. So please don’t miss the opportunity to meet a Geisha in Kyoto. Geisha would be very happy to chat with you about the differences that you have just discovered!